Teachers know how important it is to stay organized. Bulletin Boards and centers are essential to keeping organization in the classroom, but sometimes there may not be enough bulletin board or wall space in your classroom. Using magnetics in your classroom saves space and time so you can efficiently manage your classroom. 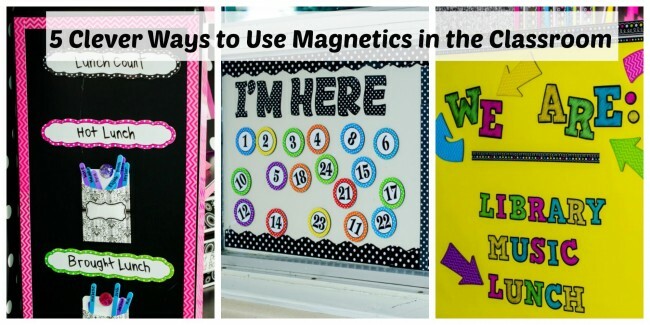 Take a look at these 5 clever ways to use magnetics in the classroom. Create a Where We Are Center in the classroom to keep track of class whereabouts. Use Magnetic Letters to list common locations where the class may be. Have a student move a Magnetic Arrow Accent to the new location prior to leaving the classroom. This way, if a student is late or another teacher is looking for the class, they will be able to locate where the class is. To make the center stand out, you could add bright yellow bulletin board paper and Chalkboard Brights Magnetic Strips. The photo above shows the Where We Are Center on the side of a metal file cabinet. The great thing about Magnetic Letters, Accents, and Strips is that you can use them on old furniture or any unused metal space in your classroom. 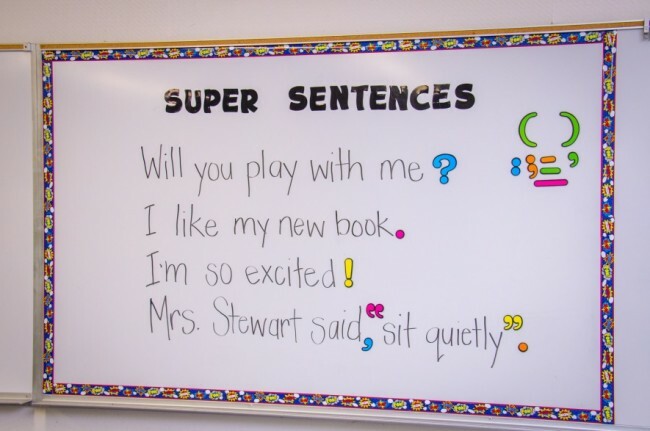 Super Sentences is a great whiteboard activity that the whole class can participate in. Create an area on your whiteboard for this activity by using Magnetic Border Trim. Write 4-5 sentences with grammatical errors. Have a student use Magnetic Punctuation Marks Magnetic Accents to correct the sentences. Need to do a class poll? Use Magnetic Letters to ask students a question or put up a topic on the whiteboard. Write down the possible answers below it, leaving space for student names. Write each name on a Magnetic Label and have each student add the Magnetic Label with their name on it to their answer. In the example above, the teacher asked students to help decide what sport they would play outside. 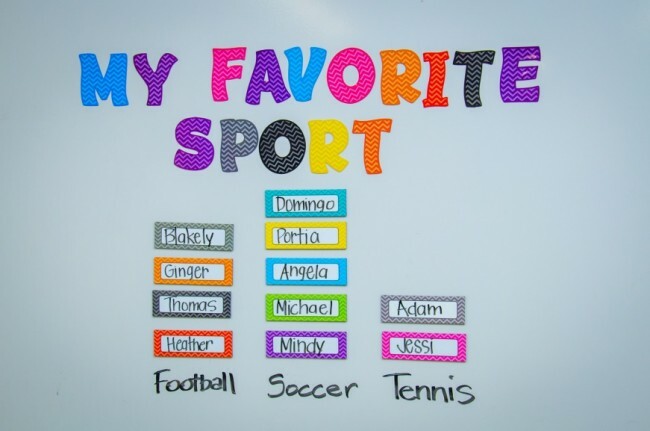 She created a Favorite Sport Poll on the whiteboard. Help your student learn responsibility by having them track attendance. This will not only give students the pride of handling their own task but also helps manage the start of the school day. Arrange a I’m Here and Absent column using Magnetic Letters and Magnetic Border Trim. 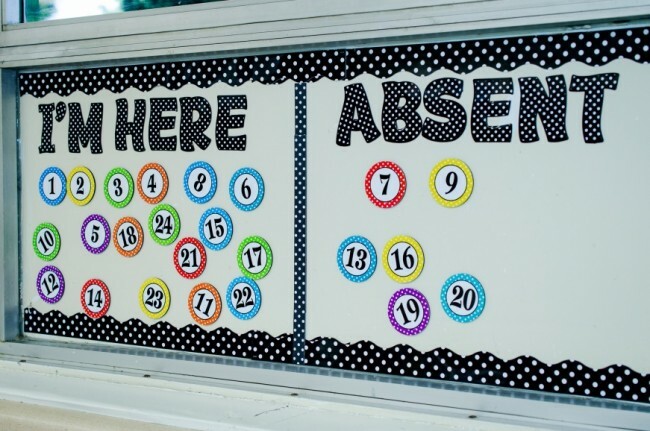 Place Polka Dot Number Magnetic Accents representing each student in the Absent column. Every morning as the student comes in, have them move their number from the Absent column to the I’m Here Column. Keep track of lunches by creating a Lunch Count area. We used the side of metal book case in the photo above. First, write each student’s name on Plastic Craft Sticks and set aside. Use Magnetic Strips to designate your space. 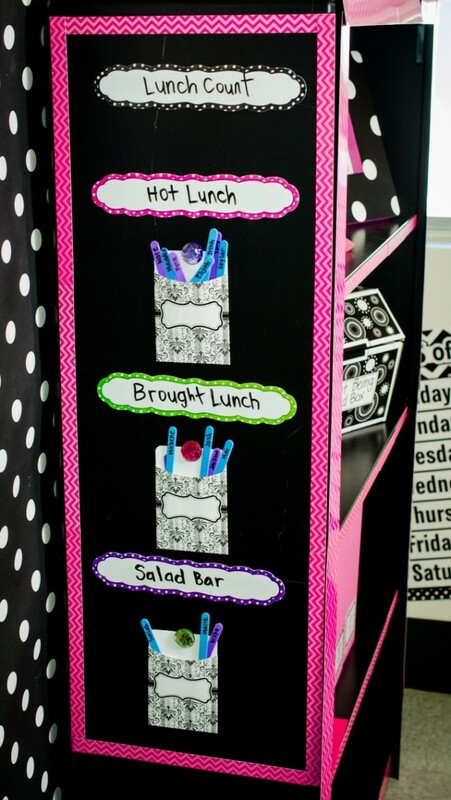 Write Lunch Count, Hot Lunch, Brought Lunch & Salad Bar on Large Polka Dots Label Magnetic Accents. Place the Polka Dots Magnetic Accents in your space, leaving room for three library pockets. 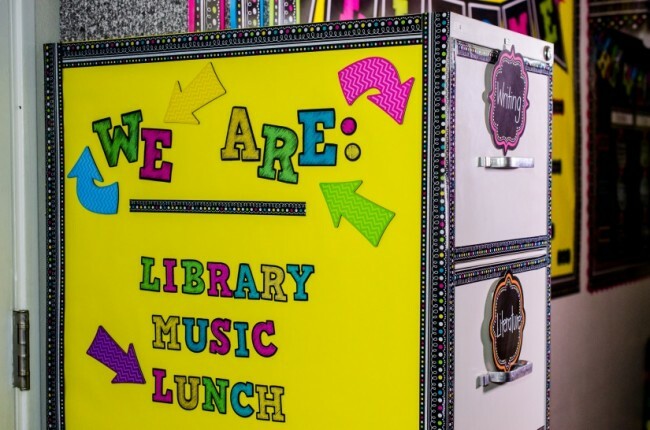 Add one library pocket under hot lunch, brought lunch, and salad bar, and secure with Colorful Bling Magnetic Jewels. Have students place the craft stick with their name on it in their designated lunch pocket.